The late 18th century gazebo was originally a garden feature of Sunnyfield House before the construction of Westgate Road. It is a two-storey building with a timber cupola. 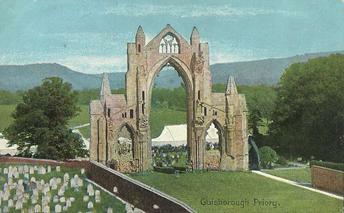 The canons of Gisborough Priory built a dovecote in the 14th century. It was rebuilt in the mid 18th century as part of the Old Gisborough Hall estate when a pyramidal roof and an open-sided cupola were added. The timber nesting boxes have been removed. It is now surrounded by a market garden, and is used as a tool store. EASTON-NAB, an eminence in N.R. Yorkshire; on Barnaby-Moor, near Guisbrough. It has a height of 784 feet; and is crowned with a beacon, a square turret, which commands one of the grandest prospects in England. 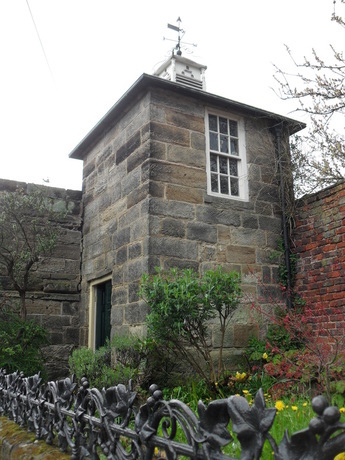 The tower was at one time used as a dwelling before being badly damaged and demolished in 1956. In an engraving by Kip in 1709, the east end of Guisborough Priory is an important feature of the gardens of the Old Hall. At some time the wall below the window was removed to accentuate the arch as an eyecatcher. On a garden plan of 1773, a north-south path is aligned with the end of the east end of the priory wall to create an eyecatcher. At Walsingham, Norfolk, the priory window was also used as an eyecatcher.